Occasionally throughout the year, Booth University College will bring in special guest speakers for exclusive events that are open to all of our students, alumni, faculty, staff and friends of Booth UC. This includes guest lecturers in our Earl Robinson Memorial Lecture Series; guest speakers at special Booth University College events such as Convocation or during Chapel; as well as world-renowned guest lecturers and speakers on varied topics of interest and importance. The Salvation Army, in partnership with Booth University College, established this special lecture series to mark the many contributions of Colonel Earl Robinson to the establishment of Booth University College and to the larger Salvation Army. The lecture series is designed to stimulate serious reflection and dialogue on the intersection of Christian faith, The Salvation Army mission and theology, and the world. Established with a gift of $100,000, the endowed lecture series will create the opportunity for prominent lecturers to enrich the intellectual life at Booth UC. The first Robinson lectures took place November 3-4, 2013 at Booth University College with inaugural guest speaker, Dr. Paul Chilcote, Academic Dean and Professor of Historical Theology and Wesleyan Studies at Ashland Theological Seminary in Ohio, USA. Visit Booth UC’s YouTube channel to watch Dr. Green’s lectures. 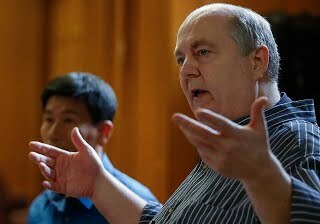 “Exploring the Nexus Between Academic Freedom and Ecclesial Expectations” was presented by Major (Dr.) Dean Smith, Dean of Students and Senior Lecturer in Theology and Philosophy at Nazarene Theological College, Queensland, Australia. STAY TUNED FOR INFORMATION ON OUR NEXT EARL ROBINSON MEMORIAL LECTURE SERIES. If you want to be kept up to date on Booth University College events and news, subscribe to our email list.